Pax Lube Systems help stampers increase production speeds, reduce lubrication usage, extend die life and improve part quality. Whether it’s heavy draw lube, or light viscosity lube, Pax can supply a lubrication system for most applications. Pax Low Profile Conveyors were developed for on-bolster, under-die part and scrap removal. Its low, 3/8″ tray to belt height allows it to fit where other conveyors can’t, and its ability to withstand lubrication allows it to survive in the harsh metal stamping environment. Pax EGD Oscillating Conveyors were developed to perform part and scrap removal at conveying speeds up to 25 fpm. The high torque, low maintenance, electrically driven, elliptical geared design drives the trays, which are attached to the cross bar via quick connect brackets. Pax Drum Motor Conveyors utilize a sealed, motorized pulley that is ideal for dirty environments. These extremely rugged conveyors can be customized as required to automate the part and scrap removal process. 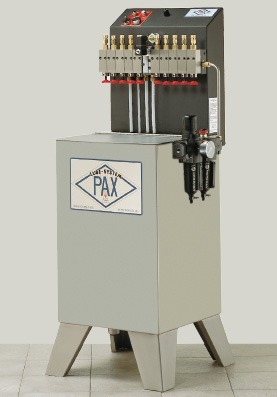 Pax Press Doors are designed to provide the safety of a hard barrier while providing quick and simple installation and a method of containing and controlling die lubricants. The user friendliness of these doors is unsurpassed. If you’re interested in learning more about Pax products for fabricators, please contact us today. We look forward to hearing from you!